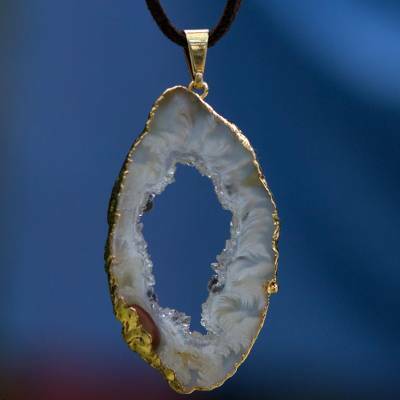 Brazilian Uncut Agate Necklace on Suede Cord, "Magnificent Nature"
By artisans from Joias do Rio, this necklace features a free-form agate in a setting flashed in gleaming yellow gold. The handcrafted necklace showcases Brazil's magnificent gemstones, and a long brown suede cord completes the design. It ties around the neck at the desired length. No two gemstones will be exactly alike in shape and color, making each necklace a unique work of art. You can find long agate pendant necklace 'Magnificent Nature' by Joias do Rio in jewelry categories such as Gemstone Necklaces, Birthstone Necklaces, Agate Necklaces, Drusy Necklaces, Suede Necklaces, Copper Necklaces, Pendant Necklaces, Cord Necklaces and Long Necklaces. Enjoy exploring these sections for other Novica treasures.